The National Monument to the Forefathers, formerly known as the Pilgrim Monument, commemorates the Mayflower Pilgrims. Dedicated on August 1, 1889, it honors their ideals as later generally embraced by the United States. 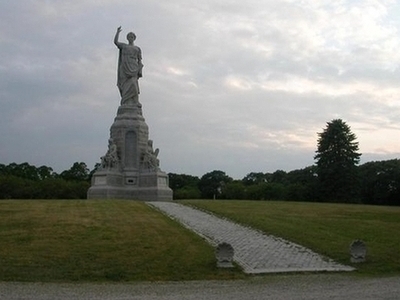 It is thought to be the World's largest solid granite monument, and is the third-tallest statue in the United States. Hammatt Billings, Boston architect, illustrator and sculptor, originally conceived the monument as a 150-foot-tall (46 m) structure comparable to the Colossus of Rhodes. 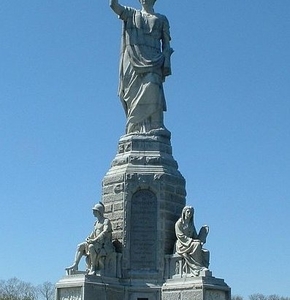 Shortly before his death in 1874, Billings reduced the size of the monument, which was to be made entirely of granite quarried in Hallowell, Maine. The project was then passed to Billings' brother Joseph who, along with other sculptors including Alexander Doyle, Carl Conrads, and James Mahoney, reworked the design, although the basic components remained. The monument, which faces northeast to Plymouth Harbor (and, roughly, towards Plymouth, England), sits in the center of a circular drive, which is accessed from Allerton Street from the east. The plan of the principal pedestal is octagonal, with four small, and four large faces; from the small faces project four buttresses. On the main pedestal stands the heroic figure of "Faith" with her right hand pointing toward heaven and her left hand clutching the Bible. Upon the four buttresses also are seated figures emblematical of the principles upon which the Pilgrims founded their Commonwealth; counter-clockwise from the east are Morality, Law, Education, and Liberty. The monument was listed on the National Register of Historic Places on August 30, 1974. Originally under the care of the Pilgrim Society, it was given to the Massachusetts government in 2001. It and Plymouth Rock constitute the Pilgrim Memorial State Park. Although intended as national in scope, the Forefathers Monument is not a federal "National Monument" as understood today from the Antiquities Act of 1906. In 2012, Kirk Cameron released the movie Monumental which features the monument and Cameron's interpretation of its history and the values of those it commemorates. 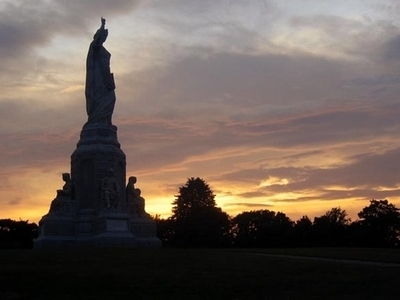 Here's the our members favorite photos of "Monuments in Plymouth". Upload your photo of National Monument to the Forefathers!